“New blood brings new ideas. It allows me to have my vision re-widened, to see things through other peoples’ eyes and that’s great.” So says textile designer, Peter Fasano. 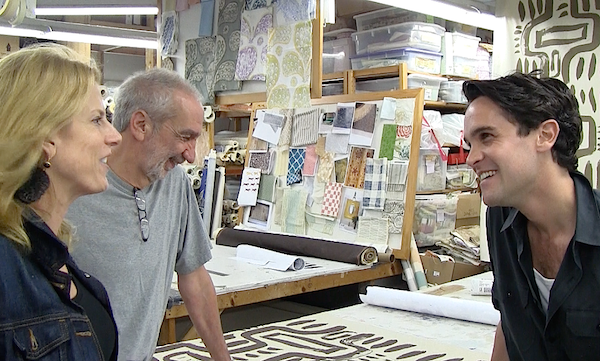 Producing hand silk-screened fabrics and wallcoverings in his Great Barrington, MA studio for over thirty years, the industry veteran recently welcomed four rising NYC design stars for a collaboration. Young Huh, Patrick Mele, Sara Gilbane Sullivan and Garrow Kedigian brought their inspiration and ideas for custom fabric designs to Peter’s studio and the artistic brainstorming began. Susanna and I made the road trip up to the Berkshires to see the team in action. And although Sara couldn’t be with us that day, we saw the birth of her beautiful fabric as well. Join us behind the scenes for an insider video visit to witness the process from inspiration to printed product. In an unassuming building on the edge of town, the constant hum of “barely-controlled anarchy” as Peter describes it indicates business as usual. 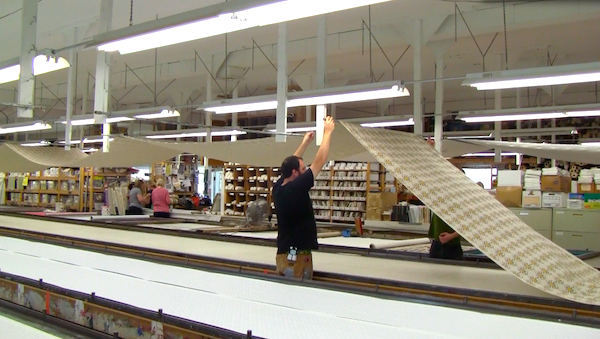 Every aspect of production, except the final finishing is done in-house. 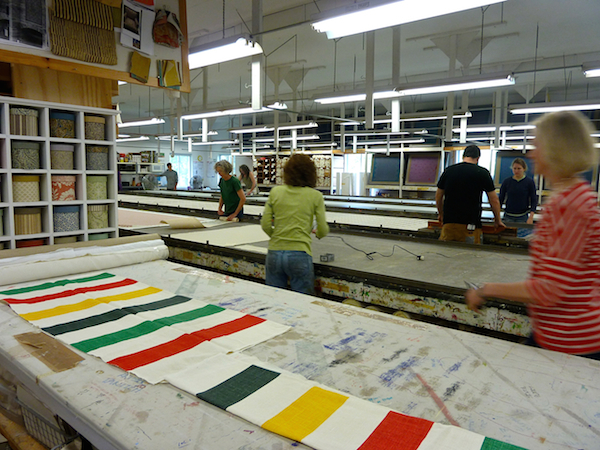 From the creation of the design, to transferring it to the screens using a photographic emulsion set with ultraviolet light, to hand silk screening each color at the required repeats to hanging the 30 yards of fabric to dry, each step is manually executed. While it is a labor intensive process, the results are fabrics with a distinct artisanal hand printed on a wide range of materials. 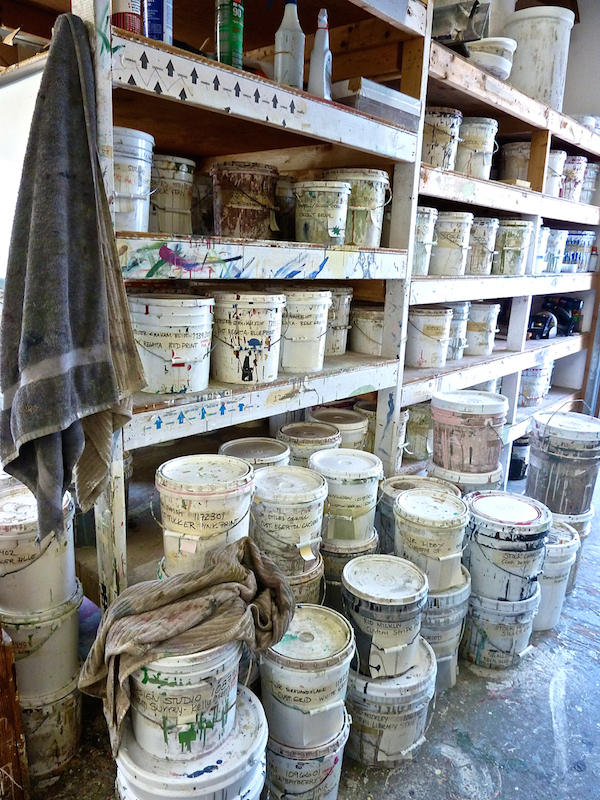 And because Peter and his staff mix all their own paints, the process is conducive to creating custom colorways. In fact, custom orders account for about 40% of their work, with surprisingly reasonable minimums. Working with designers is what Peter likes best. “My line is such a reflection of people saying to me can you do this? Will you do this? And some of the best stuff happens from just trying.” This creative collaboration is really the sum of the total talent on both sides – the designers and the entire staff at Peter Fasano, each bringing out the best in each other. It was inspiring to be along for the ride. If in the NYC area, you can see the collection and help celebrate tomorrow, as Peter and all four designers will be presenting their fabrics at John Rosselli on the 18th floor in the D&D building (979 Third Avenue). You are invited to come for breakfast and a preview from 9:00 – 11:00 am (RSVP Dana Grunow at 203.966.8203/ [email protected] ). And of course, in addition to the showroom, the fabrics are all available to purchase through Peter Fasano here or by calling the studio directly 413.528.6872. This entry posted in design, In the Studio with, interior design, Quintessence video series, Stylish Shopping, travel. Entry Tags: custom fabric, Decorating, design video, Designer Fabric, Garrow Kedigian, interior design, Patrick Mele, Peter Fasano, Sara Gilbane, Textiles, Young Huh Bookmark the permalink. I love Peter Fasano’s work. I have met him in person and he is as genuine an artist and person as it gets. Anyone would be lucky to have him reproduce his ideas! Great article! If only I could be at John Rosselli’s for the unveiling; however seeing this fabulous (as always) video was such an eye opener. The designers, their inspirations, the actual work and colorways! Thank you for sharing this artistry! It was a blast having you and Susanna at the studio to watch it all unfold! What a fun group of designers and a terrific day. This was the most fun day! Inspiring and eye opening on so many levels. So lucky to be able to work with all these designers. I love what I do – 90% of the time. I adore Peter’s fabrics. I have been dying to use them in my own home! Amazing and so interesting to get a behind the scenes look!! The fabrics will be beautiful and are obviously a labor of love! 84 queries in 0.769 seconds.